Ukrainian engine producer Motor Sich is developing a new version of the MC-500B turboshaft engine. The new version, МС-500В-03, will power the twin-engine utility helicopter PZL W-3A Sokół produced by the Polish OEM, PZL-Świdnik (part of Leonardo, formerly Finmeccanica). The МС-500В-03 will have a nominal thrust of 1100 hp. It will be built around the core of the MC-500B-01, the engine that received the Interstate Aviation Committee’s certification at the end of April. Motor Sich is currently completing modeling of the engine on the rotorcraft, with the first engine start scheduled for June of this year. W-3A Sokół is currently equipped with PZL-10W. The model is derived from the Soviet TVD-10 turboshaft engine, and produced in Poland by WSK PZL — Rzeszów, a part of Pratt & Whitney. Its nominal thrust is 888 hp. 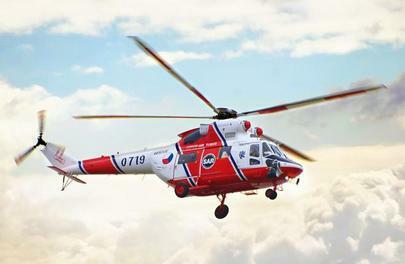 Industry experts believe that equipping the helicopter with a more powerful engine will require redesign of the main gear-box. The 630 hp base model of the МС-500В family was certified in May 2014. It is designed to power light helicopters with 3-3.5 tons MTOW. There have been talks of adapting this model for the Russian-built Ansat. The МС-500В-01 modification, with 810 hp thrust, is intended for helicopters with 4.5-5 tons MTOW, such as the Sikorsky S-76A/С/D. The Ukrainian OEM is currently planning to introduce one more member of the family, the 950 hp МС-500В-02. The series feature a radial compressor with an 11.2 compression ratio.